I recently completed another swap over on Flickr. This one was called the Pillow Talk Swap and was organized and hosted by all-around cool chicks Heather & Kerri. 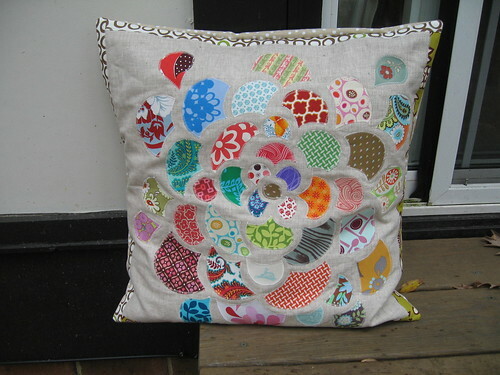 For this swap, we were asked to make a homemade modern, urban pillow or pillow cover for a secret partner. As you may have gathered from previous blog posts, I really enjoy making pillow as they are a nice departure from always making mini quilts. Plus, they're functional and great to have around the house! 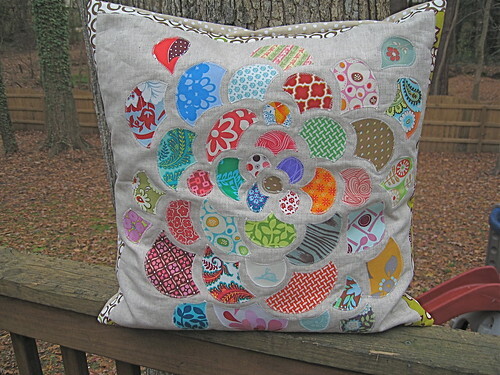 I saw the pictures of this pillow in the group before I even knew it was mine, and I was completely in love with it. I've long admired Denyse Schmidt's Single Girl pattern, but haven't been confident enough to tackle it myself. The best part? Amanda used the same shade of grey Kona Cotton that I recently sent out to her and the other SewConnected 2 swappers to make mini neighborhood quilt blocks for me. She did this so that the pillow would match the quilt. How cool is that??! It's really thoughtful, special touches like that that make swapping with other wonderful crafters so enjoyable and fulfilling. I drew fellow manquilter Ryan of I'm Just a Guy Who Quilts as my secret partner. Once I knew I'd be making a pillow for Ryan, it was pretty easy to decide what to do. He really expressed a lot of love for a mini quilt that I made recently based upon some of my favorite pillows from Antropologie, so I revisited that design and made a pillow version for Ryan! The main part of the pillow is made from some great Aiden linen that I got from Kathy's shop, Pink Chalk Fabrics, and a whole bunch of scraps of some of my favorite prints. This project is a really great scrap buster! For those of you wondering how I made this, I first cut a sheet of Heat 'N Bond the same size as my panel (18" x 18" for this pillow). I sketched the dahlia design directly onto the paper side of the HnB. Then, petal by petal, I cut each piece out from the HnB, peeled the paper backing off, fused it to a piece of scrap fabric, and then fused the petal onto the linen. There are two tricks to this: devising a system so that you don't get lost in where each petal should be placed (trickier than it seems), and also making sure your drawn petals are mostly symmetrical, since your actual flower will be a mirror image of the one you've sketched. Once everything was fused into place, I added some border strips to bring the pillow front up to 20.5" x 20.5" (so that it would finish at 20" x 20", a pretty standard size for pillow forms). I then spray basted the entire pillow top to a piece of batting slightly larger than the pillow top. I brought the two layers (top and batting only -- no backing) to my maching and, using a small zig-zag stitch, first stitched in the ditch between the linen and the borders, and then machine stitched around each petal. All in all, a very easy (though time-consuming) process. If you decide to make something in a similar way, I'd love to see it! I love the pillow you made so much! I really love this pillow John! Thanks for putting so much effort into it. I set it right next to my work surface for now. It's providing lots of inspiration. The fabrics you selected work so well together. I was meaning to ask you what type of linen you used for the background. I've ordered from Kathy's shop before and will have to visit again. The Aiden is much softer than the blend I've been buying. That pillow is SO great! I love the pillow - it's a beautiful creation. Thanks for sharing - it would be a great tutorial! That is so beautiful!! You make some good pillows! I'm glad you had so much fun John!!! Can't wait for round two! The fabrics you selected work so well together. John, would you consider drawing the pattern and selling it? I love this pillow but can't draw to save my life. :) You could sell the patterns on Etsy!